Do Aliens walk among us? One out of ten people may have encountered an Alien without knowing it. They could be a friend, a neighbor, even a relative. A growing number of people believe Aliens have visited Earth are here still, watching over the human race. New evidence suggests that in addition to the abductions that have been occurring for hundreds of years, Aliens have been infiltrating our society for decades. 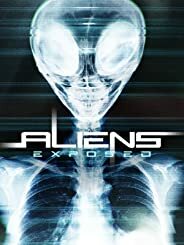 Uns sind aktuell keine Sendetermine für »Aliens Exposed« bekannt. Wie fandest du »Aliens Exposed«?